Best part: The electrifying performances. Over the past thirteen years, filmmakers and studios have milked the proverbial zeitgeist teat. Though major political, economic, and cultural events have been re-enacted previously, the 21st century’s biggest issues are being flogged for our entertainment. United 93 and World Trade Center re-created America’s darkest day, Zero Dark Thirty depicted the hunt for Osama bin Laden, while The 25th Hour tackled the saddest New York imaginable. However, spy-thrillers like A Most Wanted Man face the nitty-gritty of post-9/11 paranoia. Phillip Seymour Hoffman’s all-encompassing swan song. Luckily, A Most Wanted Man takes the high road throughout. Looking into a distressing magic 8-ball, the movie refuses to offend anyone. However, it still tells an effective and meaningful tale. Adapted from acclaimed author John le Carre’s recent novel, this spy-thriller honours the legendary writer whilst taking a different path. In addition, the movie efficiently tackles the War on Terror. The title cards, layered over an arresting shot of the ocean crashing into a dock, inform us of important historical events. After learning Islamic extremist Mohammed Atta had planned the World Trade Centre attacks in Hamburg, Germany, the US Government developed a task force there to destroy future potential threats. In this fictional account, we meet the people in charge. In its latest mission, lead espionage agent Gunther Bachmann (Phillip Seymour Hoffman) tasks his team – bolstered by Erna Frey (Nina Hoss) and Max (Daniel Bruhl) – with tracking illegal immigrant Issa Karpov (Grigoriy Dobrygin). Working off the local Muslim community and CCTV footage, Gunther’s team finds Karpov in a decrepit housing complex. Simultaneously, the team tracks Muslim philanthropist Dr. Faisal Abdullah(Homayoun Ershadi)’s suspicious activities. Robin Wright taking time off from House of Cards. Despite being Europe’s most prolific counter-terrorists, Gunther and co. must make their case before German security official Dieter Mohr (Rainer Bock) and American diplomatic attache Martha Sullivan (Robin Wright) take over. Obviously, A Most Wanted Man is devoid of a James Bond or Jason Bourne. Lacking gadgets, lavish vistas, or explosions, the average filmgoer might reject this intricate and claustrophobic effort. However, its narrative grips the viewer from the first to last frame. Its surprises, lacking the typical action-thriller bombast, are hearty breaths of fresh air. The mystery, placing professionals in realistic yet unpredictable situations, never relies on standard tropes. Standing alongside its competition, the story – aided by Andrew Bovell’s meticulous screenplay – rests on its characters’ strengths and weaknesses. Fuelled by intensive conversations and chases, the spying is as mature and concise as our characters. However, the story – depicting Gunther’s team forming alliances with distressed lawyer Annabel Richter (Rachel McAdams) and renowned banker Tommy Brue (Willem Dafoe) – never delivers enough emotional resonance. Avoiding major thrills, the movie occasionally tests the viewer’s patience. Based around political conflicts and slow-burn espionage, some may beg for fistfights or shootouts. The first-two thirds, though peppered with harsh truths and tense sequences, won’t raise anyone’s blood levels. “Every good man has a little bit of bad, doesn’t he? And in Abdullah’s case…that little bit might just kill you.” (Martha Sullivan (Robin Wright), A Most Wanted Man). Rachel McAdams making major career strides. Despite the minor flaws, A Most Wanted Man‘s positives make for pitch-perfect sequences. Fuelled by witty lines and surveillance jargon, this glacially paced drama soars when required. The last third, driven by a heart-wrenching climax and bitter resolution, delivers 2014’s most gripping moments. Director Anton Corbijn (The American, Control) applies his strengths to each frame. Known for uncompromising flourishes, his style rescues certain sequences from tedium. Dodging The American’s immaculate sheen, his depiction of Hamburg is worth the admission cost. Enlivening each setting, he revels in the city’s architecture, grit, and history. In addition, Benoit Delhomme’s cinematography highlights each scene’s viscera and value. 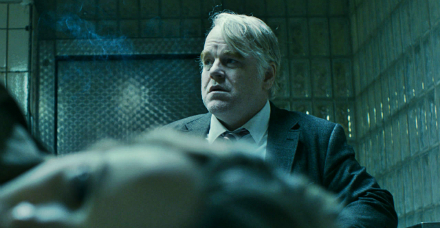 Beyond this, Hoffman delivers one of the year’s most profound performances. In his penultimate feature, Hoffman injects vigour and malice into this invigorating protagonist. In particular, one scene solidifies Hoffman and his character’s immense worth. After drifting out of bed, he rolls his eyes, downs a shot of whisky, then plays several notes on a piano. In this few-second scene, Corbijn cements Hoffman as one of this generation’s greatest talents. The supporting characters, though serving to boost Hoffman, further propel the story. Wright and McAdams bolster certain plot-threads with energetic and potent performances. In addition, Dafoe’s core strengths saves his plot-device role. 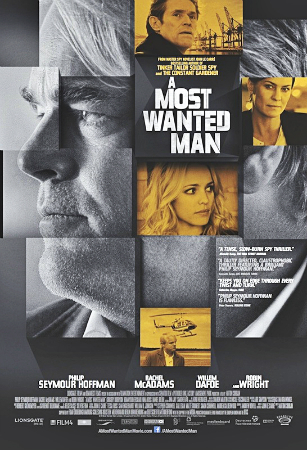 Delivering a fresh take on post-9/11 paranoia, A Most Wanted Man is an entertaining and comprehensive discussion of the past decade’s biggest issues. Blitzing similar pot-boilers including Tinker, Tailor, Soldier, Spy, Body of Lies, and Syriana, this spy-thriller embraces the simple to tackle the complex. More importantly, Hoffman’s scintillating performance highlights a remarkable career cut short. Like with his character, the movie’s nuances draw the line between success and failure. Verdict: An intelligent and well-crafted spy-thriller.